The Manhattan SuperSpeed USB 3.0 SVGA Converter increases productivity, improves "desktop" arrangements and extends the visual work area across multiple monitors. It makes word processing, editing and multitasking more effective with less-overlapped windows, fewer hidden palettes and better-organized views. Read e-mail on one monitor and open attachments on the other. Expand and view large, complicated spreadsheets without scrolling. Make presentations more compelling with one display for attendees and one for the speaker to view notes. The Manhattan SuperSpeed USB 3.0 SVGA Converter supports resolutions of up to 2048 x 1152 in 16-bit or 32-bit color, and its 64 MB DRAM memory easily enhances the workspace without complicated installations or expensive equipment. The convenient SuperSpeed USB 3.0 connection eliminates the need to install another graphics card or struggle with compatibility issues. It's an ideal, portable solution for notebook computers and desktop systems with graphics cards that lack additional outputs. Installation on any Windows computer is easy and no external power supply is required. 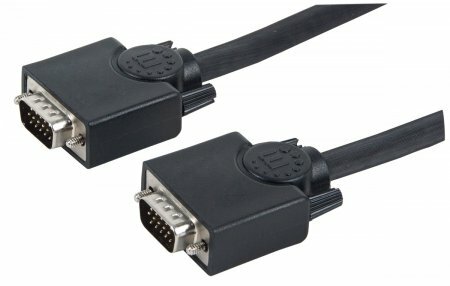 MANHATTAN SVGA Cables easily extend connections between a monitor and desktop or notebook computer. Ideal for use with video splitters, KVM switches and any HD15-equipped display, computer or device, MANHATTAN SVGA Cables are engineered and constructed of quality materials to deliver dependable transmissions in video applications. Full foil and braided shielding with ferrite cores help minimize EMI interference and mini-coax (RGB) with paired video wire construction combine to provide maximum conductivity and clear, crisp images with reduced distortion over extended distances. 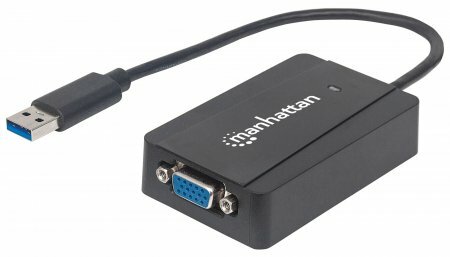 MANHATTAN SVGA Cables easily extend connections between a monitor and desktop or notebook computer. Ideal for use with video splitters, KVM switches and any HD15-equipped display, computer or device, MANHATTAN SVGA Cables are engineered and constructed of quality materials to deliver dependable transmissions in video applications. Full foil and braided shielding, molded boots with strain relief and mini-coax (RGB) and paired video wire construction help provide maximum conductivity and clear, crisp images with reduced EMI interference and distortion over extended distances. 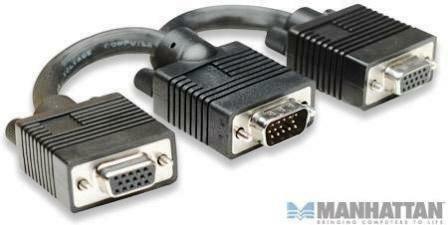 The Manhattan SVGA Extension Cable easily Extend Connections Between a Monitor And Desktop or Notebook Computer. Ideal For Use With Video Splitters, KVM Switches And Any HD15-equipped Display, Computer or Device, Manhattan SVGA Cables Are Engineered And Constructed of Quality Materials to Deliver Dependable Transmissions in Video Applications. Full Foil And Braided Shielding, Moulded Boots With Strain Relief And Mini-coax (RGB) And Paired Video Wire Construction Help Provide Maximum Conductivity And Clear, Crisp Images With Reduced Emi Interference And Distortion Over Extended Distances. 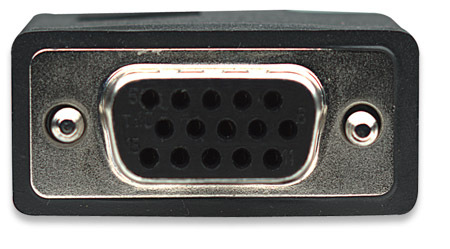 The Manhattan SVGA Cables easily connect a monitor with a desktop or notebook computer. Ideal for use with video splitters, KVM switches and any HD15-equipped display, computer or device, these Manhattan SVGA Cables are engineered and constructed of quality materials to deliver dependable transmissions in video applications. Full foil and braided shielding with ferrite cores help minimize EMI interference and mini-coax (RGB) with paired video wire construction combine to provide maximum conductivity and clear, crisp images with reduced distortion over extended distances. The Manhattan SVGA Y-Cable easily split a single signal to connect a desktop or notebook computer with two monitors. 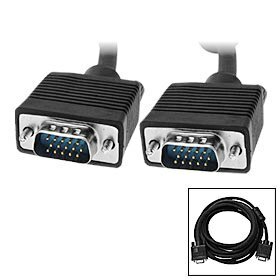 Ideal for use with any HD15-equipped display, computer or device, these SVGA Cables are engineered and constructed of quality materials to deliver dependable transmissions in video applications. Full foil and braided shielding, moulded boots with strain relief and mini-coax (RGB) and paired video wire construction help provide maximum conductivity and clear, crisp images with reduced EMI interference and distortion over extended distances.